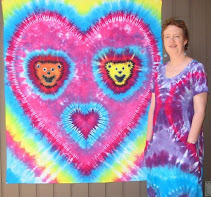 How do I combine recycling, tie-dyeing, and dogs? In this case, my daughter and I made something very similar to the draft stoppers in my earlier post: tie-dyed jeans and cut-up old socks and shirts for stuffing made into a tube with closed ends. But there are two differences here: size and a not-so-secret ingredient, squeakers! I got the squeakers at my local PetSmart. The brand is "Dr. Noys' Pet Toys", and they are marketed as replacement squeakers for that brand of dog toys. The PetSmart had them in two sizes. I used both sizes in each toy, because the different sizes sound different, and I thought it would be more interesting to the dogs to have different sounds in the same toy. I could have gotten them more cheaply in bulk via the Internet, but this was just an experiment, and I was looking for instant gratification! The toy for Moxie, the 95-pound Giant Schnauzer, is a 14-inch-long piece cut from the bottom of the jeans leg, sealed at both ends. Moxie's toy has four squeakers in it, two at each end. We sewed two squeakers into each of two old socks before putting them into the toy, so they would stay in place better. I sewed the I-beam shape in the center before stuffing so it would be easier for Moxie to hold the toy in his mouth. For Lacey, I made the toy much smaller, about 6 inches by 3 inches. It has just two squeakers, one of each size. The canine reviewers judged the experiment a success. Lacey particularly liked her toy, since she loves anything squeaky. She even came running when we squeaked the squeaker before putting it in the toy! The smaller toy worked better for squeaking, too, since there was less other fabric/stuffing to muffle the squeakers. Now if we can just teach Lacey to put away her toys when she is done playing with them... ! That's really cool. Appreciate your idea. I have plenty of old jeans that I guess I can sew and have them as toys too. I also have a Schnauzer at home and a chocolate brown labrador. When they're both out and play in the garden, it's really a mess. So I really have to think of toys for them.